Like anacondas and boa constrictors, pythons are constricting snakes, because they kill their prey by squeezing it to death. Pythons can grow from 7 to 24 feet long, and can eat large animals, including deer and wild pigs. They’ll eat almost anything they can catch. Pythons are sometimes kept as pets, but in the wild, they live in Asia and Africa. They like moist, hot places. Small pythons climb in trees. Larger pythons tend to stay on the ground. All pythons are expert swimmers. 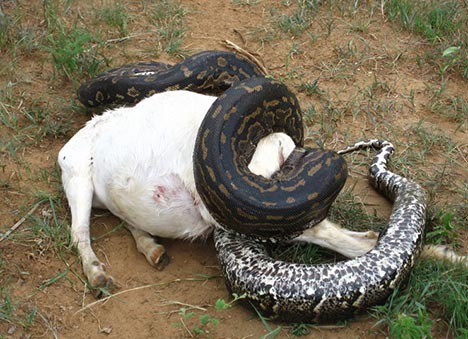 Pythons are often hunted for their skins and meat. They eat large animals, including deer and wild pigs. They’ll eat almost anything they can catch. 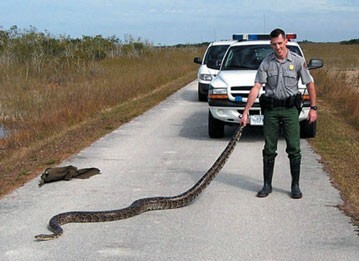 People have let their pet pythons loose in the Florida everglades. Here, they are becoming a problem because they are eating native animals, including alligators. Pythons come in many colors, including green and brown. 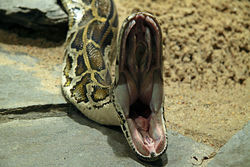 Pythons have flexible jaws that can open wide to swallow whole animals. Pythons only eat five or six times each year. A video documentary about a huge python. Question: Do pythons make good pets? Answer: Pythons can grow quite large and they also live for a long time. They need a skilled owner to care for them safely. Question: Do pythons ever attack humans? Answer: Pythons don’t normally hurt humans, but they have occasionally attacked pet owners. Usually the owners were feeding them while the pythons were out of their cages. Enjoyed the Easy Science for Kids Website all about Pythons info? Take the FREE & fun Pythons quiz and download FREE Pythons worksheet for kids. For lengthy info click here. Declan, Tobin. " Python Facts for Kids ." Easy Science for Kids, Apr 2019. Web. 23 Apr 2019. < https://easyscienceforkids.com/all-about-pythons/ >.